The Kyoto Hotel in Kyoto City. The postcard proudly proclaims that K. Inoue is the owner of the hotel. The hotel was opened as the Tokiwa Hotel (常盤ホテル) by Matakichi Maeda (前田又吉) on April 14, 1890 (Meiji 23). 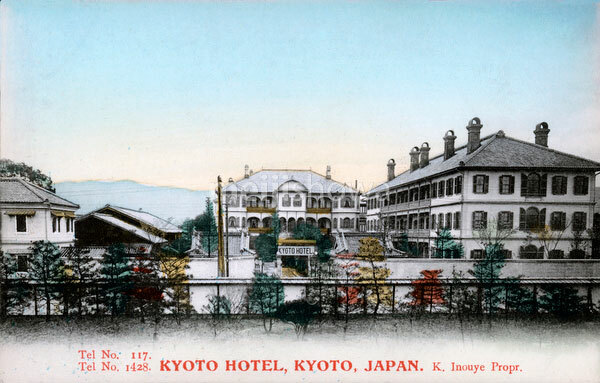 The name was changed to the Kyoto Hotel in 1895 (Meiji 28). The building on this postcard was designed by Jimbee Kawashima (川島甚兵衛, 1853-1910). The hotel was owned by Kitaro Inoue (井上喜太郎) from 1895 to 1927. A modern building replaced the traditional building in 1994 (Heisei 6).